“For nearly 40 years, week in and week out, millions of children across the country would rush home from school to lie sprawled on sofas and living room floors, hoping against hope that their latest masterpiece in corrugated card, crayon, straws, wax and, more often than not, pasta, had made it into Tony Hart’s “Gallery”. The odds were stacked against them. 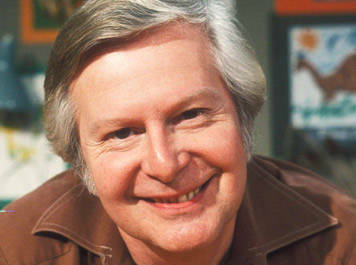 On average, Hart, whose programmes Vision On (1964-76), Take Hart (1977-83), Hart Beat (1983-93) and Smart Hart (1999-2000) were a linchpin of children’s TV, received 10,000 pictures a week. Only about 25 of those survived the culling process, which, according to a biography of Hart written by his daughter, Carolyn, began with a small workforce of retirees scrutinising and discarding the majority, and ended with Hart trying to even the playing field by ensuring every age, from four to 14, was represented.